NEW YORK — Defeat the defending champion in the opening round of a Grand Slam, and you’re allowed a moment. So Naomi Osaka of Japan would have gotten a pass had she tossed her racket, dropped to her knees or even moonwalked after her opening-round win over No. 6 seed Angelique Kerber in the US Open. Watching Kerber hit a return into the net to end the match, the unseeded Osaka did none of the above. 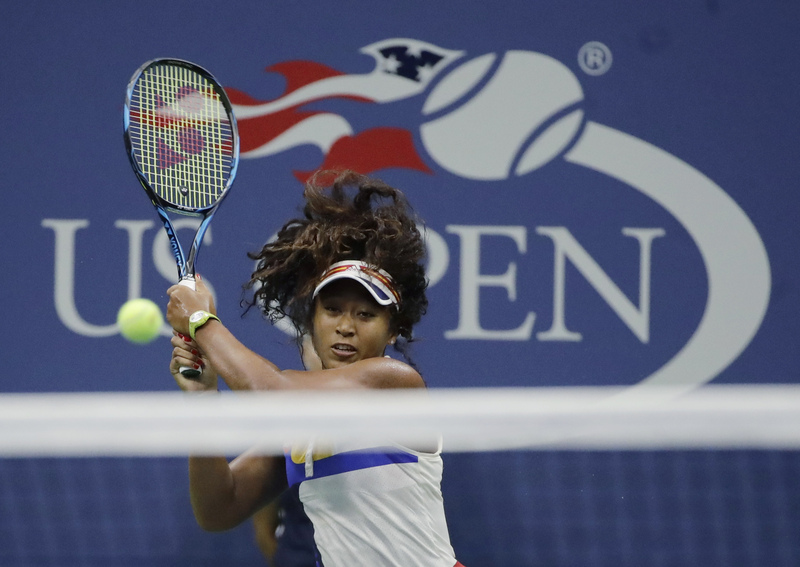 Void of any type of emotion, the 19-year-old Osaka walked calmly to the net after taking just over an hour to easily defeat Kerber, 6-3, 6-1, in front of an appreciative crowd at Arthur Ashe Stadium. Osaka’s win was the start of an impressive day for players of color under the roof of the main court on a day where most of the matches were washed out. Madison Keys, seeded 15th, opened the night session with a straight-sets win over Elise Mertens of Belgium, 6-3, 7-6 (6). And in the last match of the day, 19-year-old Frances Tiafoe, whose parents are immigrants from Sierra Leone, put a scare in Roger Federer before losing to the No. 3 seed in an epic five sets (4-6, 6-2, 6-1, 1-6, 6-4). 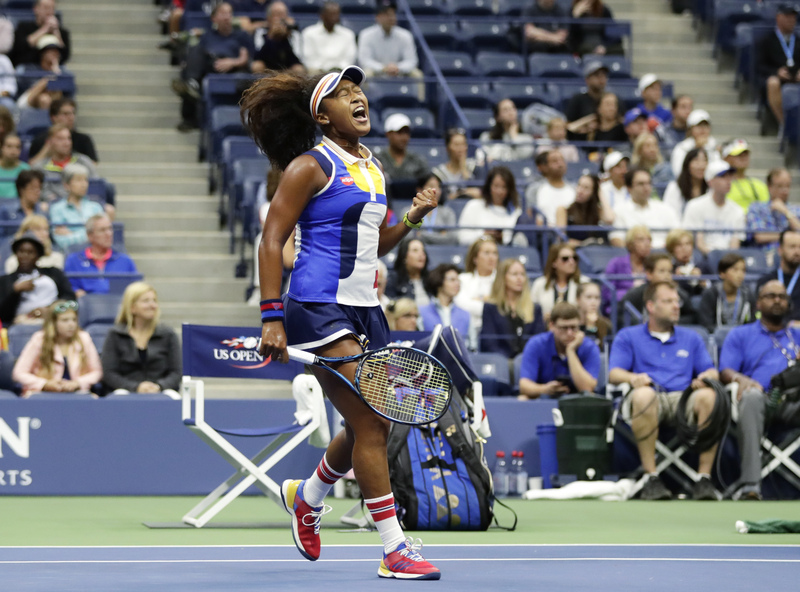 Tuesday’s shocking win by Osaka proved for the second straight day that the women’s singles division of the US Open, in the absence of the pregnant Serena Williams, is wide-open. Osaka’s first win over a top-10 opponent (Kerber is also ranked No. 6 in the world) came a day after second-seeded Simona Halep lost to unseeded Maria Sharapova, a career Grand Slam winner playing her first major since returning from a suspension for a failed drug test at the 2016 Australian Open. Naomi Osaka of Japan reacts after scoring a point against Angelique Kerber of Germany during the first round of the US Open tennis tournament Tuesday in New York. Perhaps the subdued reaction of Osaka, No. 45 in the world, was due to the memories she had from the last time she played at Arthur Ashe Stadium in the third round of last year’s US Open, when she lost to No. 8 seed Keys. Up 5-1 in the final set, Osaka dropped the next five games before eventually losing the third-set tiebreaker in a collapse that was painful to watch. She may have felt nerves on the inside, but they were kept hidden from her opponent and the fans. Osaka had the court well-covered with her agility and kept Kerber on the defensive the entire match. Kerber, who hasn’t played well this year, had five double faults (Osaka had none) and 23 unforced errors. There were questions about Osaka’s health entering the US Open. In her previous match at the Rogers Cup last month in Toronto, Osaka retired with abdominal pain while down 1-0 in the third set of a winnable contest against world No. 1 Karolina Pliskova. Born in Japan, Osaka is a citizen of both the United States and Japan. She represents Japan (as does her older sister, Mari Osaka) despite the fact that she’s lived in the United States since she was 3 years old, even spending part of her childhood on Long Island, New York, not far from the USTA Billie Jean King National Tennis Center in Queens. As Osaka and her older sister played as kids, they were often asked whether they were destined to be the next Williams sisters. Osaka, who idolizes Serena Williams, said she was nervous when she faced Venus Williams in the third round of Wimbledon this year, losing in a hard-fought match (7-6, 6-4). Osaka said playing against Williams at Wimbledon helped her against Kerber. Osaka used to get really nervous answering questions from the Japanese media. When the moderator of a postmatch news conference turned it over to the Japanese media last year, Osaka, who is not fluent in Japanese, begged off. Naomi Osaka of Japan returns a shot from Angelique Kerber of Germany during the first round of the US Open tennis tournament Tuesday in New York. Osaka won 6-3, 6-1. That changed in last year’s French Open, and on Tuesday Osaka took questions in Japanese (while answering in English). Despite her mixed racial heritage, Uchida said, Osaka is fully embraced in Japan. Jerry Bembry is a senior writer at The Undefeated. His bucket list items include being serenaded by Lizz Wright, and watching the Knicks play an NBA game in June.